Al Gore has called on the U.S. to "commit to producing 100% of electricity from renewable energy and truly clean carbon free sources within ten years." 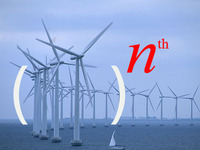 But the ten-year hard-fought battle to secure approval for Cape Wind shows that we cannot come close to meeting even a fraction of his goal if we do not appreciate the scale of energy challenge and the incredible pace of clean energy innovation and deployment required to truly reduce carbon emissions and mitigate climate change. First, let's put Cape Wind in perspective. A $1 billion dollar project, America's first offshore wind farm will consist of 130 turbines that can produce roughly 1.6 billion kWh of electricity annually, enough to power three-quarters of the homes on Nantucket and surrounding islands. But on a national scale, this iconic project will only meet about 0.04% of the total (forecasted) U.S electricity demand in 2010, expected to be about 3,784 billion kWh. According to a New York Times infographic (below), should all the offshore wind projects planned for deployment in Atlantic waters come into service, they would add between 2,261 and 2,426 MW of new wind power capacity in total, producing just about 0.1% of 2010 U.S. electricity demand (annual output calculations for offshore wind farms here and elsewhere in this post assume an average capacity factor of 35%). But that's just the United States. Electricity demand is rising globally, particularly in developing nations, and is expected to double by 2030 to about 28,140 billion kWh. This breakneck growth belies an even harsher, more humbling reality about the scale of the energy challenge. It would take approximately 3,000 Cape Winds to meet forecasted U.S. electricity demand in 2030 (which could rise to 4,801 billion kWh), and it would take more than 17,550 offshore wind parks the size of Cape Wind to meet global electricity demand in 2030. The U.S. is far from the only country taking strides into offshore wind, but the reality for rapidly developing nations like China who recently deployed its first offshore wind farm as well, is no less daunting. In April, China installed its first 102 MW of offshore wind. Recent reports suggest China plans to invest $100 billion towards a goal of 30,000 MW of offshore wind power by 2020. Should China achieve this benchmark, offshore wind could account for about 1.3% of its total electricity demand in 2030. Just to achieve its stated offshore wind goals, however, China would need about 300 more identically sized offshore wind projects, and even that ambitious objective would still leave China far short of meeting 100% of electricity demand from low-carbon sources. Ultimately, the challenges to deploying wind energy, including offshore wind, at a scale significant enough to meet growing energy demand and meaningfully reduce global carbon emission are formidable. Despite concerted efforts by world leaders like Denmark, Spain, Germany, and the U.S. to increase wind capacity, Vaclav Smil notes in Energy in Nature and Society (254) that as of 2008 wind accounted for just half of one percent of all electricity generated worldwide. And while he explains that global wind power potential could be as high as 72 terawatts (TW; 1 TW = 1 million MW), "only a very small share of that could be captured," noting that practical wind development potential could be as little 6 TW - that is less than half of current global energy demand and a fraction of the more than 30-40 TW of energy likely needed to fuel the global economy by mid-century. What these comparisons should make abundantly obvious is not simply that Cape Wind is a drop in the bucket in the effort to meet our growing energy needs - individually it represents an enormous victory - but rather that anyone serious about confronting the scale of the climate challenge should be firmly resolved that the Cape Wind experience should never happen again. Never again should it take nearly a decade just to get a clean energy project with so many calculated benefits approved, let alone constructed. If we seriously intend to reduce carbon emissions and transition to a clean energy economy, and if we want to succeed in making Cape Wind more than just a symbolic victory, the time has come for climate change advocates to ensure that this is the last time that a new zero-carbon energy source faces such prolonged NIMBY opposition. And yet, we may see a similar situation unfold in the effort to increase nuclear power capacity. In February, Obama announced $8.3 billion in loan guarantees to encourage the construction of two new 1,100 MW nuclear power plants in Georgia, set to be the first new nuclear power plants constructed in 30 years. If everything goes according to plan, including final approval from the Nuclear Regulatory Commissions scheduled in 2011, Vogtle 3 and 4 are expected to be fully operational in 2016 and 2017, respectively. Nuclear power already accounts for almost 20% of total U.S. electricity demand and as a low carbon power source, has the potential to account for even more. But as the new Vogtle reactors demonstrate, nuclear power plants are expensive, take the better part of a decade to deploy, and face environmental resistance due to persistent concerns about waste. Given the scale of the global energy challenge, zero-carbon energy projects like Cape Wind and the Vogtle nuclear power plants must be the number one priority for anyone who claims to cares about mitigating climate change. And yet we lack an organized movement to push for and ensure the rapid deployment of viable clean energy technologies. While Cape Wind advocates battled NIMBY arguments left and right, the bulk of the environmental movement watched tacitly from the sidelines touting climate and energy bills that would do little to improve the clean energy deployment environment. If anything both Cape Wind and the Vogtle plants make abundantly clear why we have to tap into our greatest power as humans - our ability to be massively innovative. Only by harnessing the human creative potential can we hope to spur the massive technological revolution necessary to change our energy infrastructure and help us adapt to a warming world. The implications of the Cape Wind project means a great deal to the United States. As countries all around Europe have already installed many offshore wind farms, the United State has yet to really get any of its own projects in the water. No doubt, this project not only means big things for the communities near the project, but can serve as an example for future projects. As the author mentioned though, this is still just a drop in the bucket. Congress needs to adapt aggressive means that spur all of America's resources: both energy and innovation. "If everything goes according to plan, including final approval from the Nuclear Regulatory Commissions scheduled in 2011, Vogtle 3 and 4 are expected to be fully operational in 2016 and 2017, respectively." IMO, this points out why solar and wind should be priorities, as they can be built in half the time or less than it takes to build nuclear.